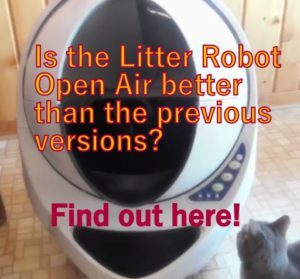 SureFeed Sealed Pet Bowl Review - Is What Your Cat Needs? (3.6/5) The SureFeed Sealed Pet Bowl is designed to keep your pet’s food fresh, keeping away flies or other insects from the food. 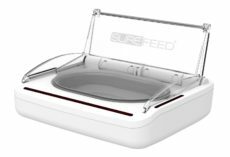 As its name says, the SureFeed Bowl keeps the food sealed with a rubber gasket on the bowl, keeping the food sealed and reducing pet food odor in the house. This door opens when an infrared sensor located on the front and sides of the bowl. The SureFeed bowl is suitable for small pets and cats. Battery operated (4 x C cell batteries – not included). Battery life up to 6 months. The feeder stays closed at all times. 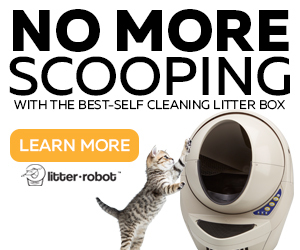 When your pet approaches the feeder, the infrared sensor located in front or sides of the bowl detects the presence of your pet and automatically the folding hinged lid folds opens, leaving the bowl uncovered. This door will remain open as long as your pet is eating from the bowl. Shortly after your pet is done eating and leaves the bowl, the lid will close covering the food and remain closed until your pet approaches the food again. 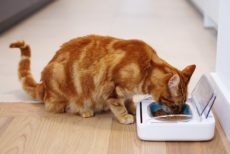 As the SureFeed sealed bowl features a motion sensor your cat doesn’t require a collar tag or microchip to work, so any pet approaching this bowl can access the food. The bowl doesn’t feature a timer so you can’t set it up at determined times for it to open. If you need to remove or place the bowl back in, the lid will open as well with your presence. 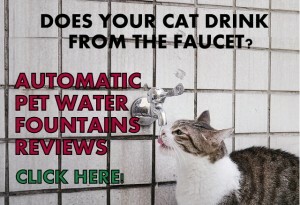 It’s important to mention that the bowl needs to be refilled and cleaned on a daily basis. 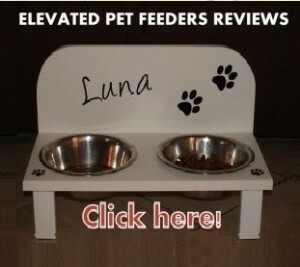 The SureFeed Pet Bowl is suitable for cats, but it can be used by small dogs as well. Sensors: These are infrared motion sensors and they are located in front and top sides of the bowl. These sensors will detect any movement within their range. 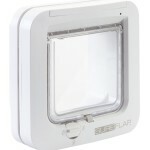 Manual Open / Close button: This button overrides the sensor this way you can keep the lid open. 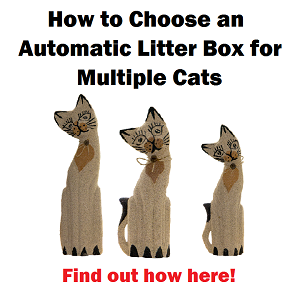 This function is used when its time to change your cat’s food. 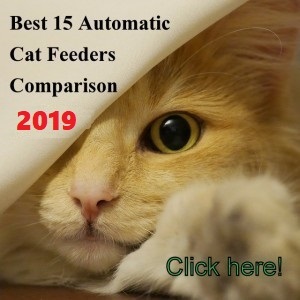 Training button: This button is useful if you have a shy cat and you want to teach it to use the feeder without scaring your pet with the lid’s movement in the beginning. 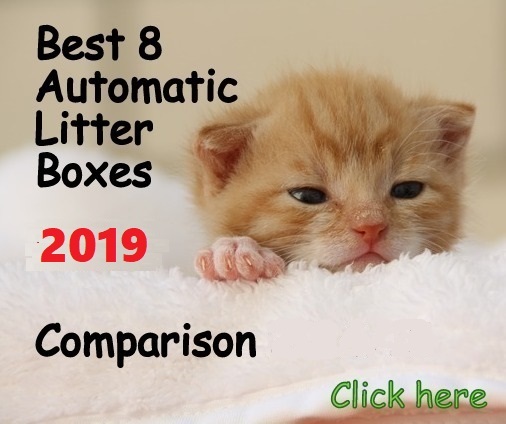 By pushing this button the feeder will have limited movements on several stages until your cat feels confident to use it with the sensors fully operating. Battery Light Indicator: The battery light indicator will flash if the batteries are low or if there is a problem with the way they have been inserted. The buttons and battery light indicator are located on the back of the feeder. You can customize the SureFeed bowl with your own preference by purchasing the colorful bowls. This way you can buy the pink for your furry girl or the blue for your boy. Also, by purchasing extra bowls you can have backups while you are washing the bowl in use. You can get the SureFeed Split Bowl and the Single Bowl. The Split Bowl helps you to place different foods, for example, dry and wet food. The single bowl allows you to put more food of the same type. All SureFeed bowls feature an integrated seal on the top edge to reduce odors and keep bugs away from the food. Your cat doesn’t need to wear heavy tags or microchip implants. With rubber on bowl edges to keep the food sealed when in contact with the transparent lid. 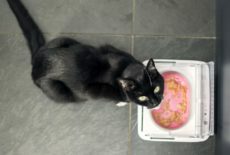 √ If you really want to add style to your cat feeding station, get the SureFeed mat matching the color of the bowl. The mat fits perfectly with the SureFeed Pet Bowl. 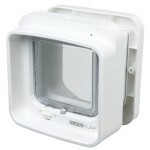 √ When you change batteries, make sure to place the feeder in its final location and then turn the feeder on. This way the motion sensors can correctly calibrate ( the sensors need to readjust to their surroundings every time the bowl is moved). √ Don’t place your SureFreed bowl under a low surface or against the wall. Try to place it away from objects that could create unwanted activations. Place the bowl approximately 4” from walls. 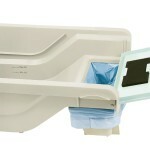 √ Don’t put the feeder in the refrigerator or ice packs under or inside the feeder. √ Make sure to keep the sensors clean to ensure a dependable operation. The SureFeed Sealed pet bowl is a good solution for people that need to keep the cat food covered or those who can’t handle cat food smell in the house. The unit keeps most of the bugs away from the cat’s food and this is a good feature. 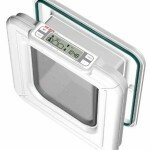 However, the big flaw of this unit is the fact that doesn’t feature ice packs to keep the wet food fresh longer, though it does keep the food fresh longer than a regular food bowl. Cats that eat small amounts of food at a time, leaving always food in the bowl. As this is a free feeding system I don’t recommend it for an obese cat, a multi-cat household or if you have a cat and a dog.